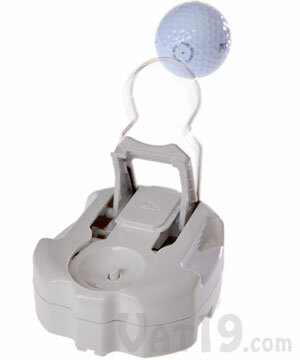 RoboCup Golf Ball Return Robot: Makes putting practice quick, fun, and painless. Serious golfers rejoice! The RoboCup Golf Ball Return Robot makes practicing your putting quick, fun, and painless. As golfing fanatics will attest, putting accounts for half (or more) of all strokes in a round of golf. 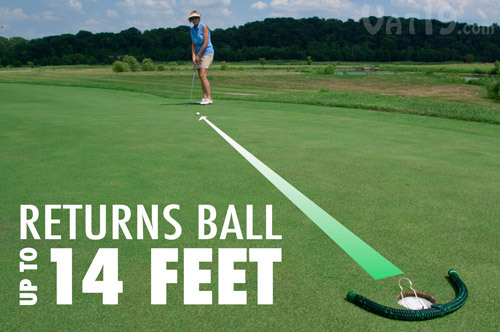 Yet, most golfers avoid the practice green like the plague because practicing putting can be boring and tedious. Thanks to the RoboCup, putting can be fun! The RoboCup Ball Return Robot fits into either practice or full-depth cups and automatically returns your ball up to fourteen feet. 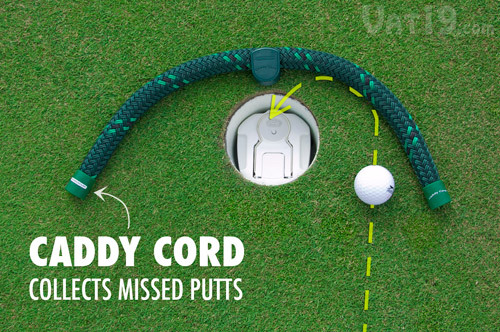 With the included Caddy Cord, even missed putts will be returned to you. One set of 4 AA batteries (not included) will last for up to 12,000 ball returns. Includes a padded carrying case. A score of par is 72 strokes. On each of the 18 holes, two strokes are set aside for putting. That's 36 strokes, or half your entire round. Even if you hit your driver off the tee on all 18 holes (rare indeed), you'd still only be using the driver half as much as your putter. Therefore, half (or more) of your golf practice time should be devoted to putting. However, most golfers avoid the practice green because it's tedious. You hit a few putts and then you have to retrieve your balls. It's also not nearly as fun as hitting your driver. With the RoboCup, you can turn the putting green into a fun practice event that will significantly improve your score. The RoboCup Ball Return Robot automatically returns your putts up to 14 feet. Depending on the speed and condition of the green, the RoboCup will return your putts up to 14 feet. This is ideal for golfers looking to improve their game because making putts in this range can easily cut ten strokes off your score. Nearly anyone can hit a 25 foot putt to within 5-10 feet of the hole. Most golfers, however, are going to miss that shorter putt (especially if it's one that really matters!). With the RoboCup, you can hit a hundred of those 5-10 foot putts in the same amount of time as you would hit a hundred drives off the practice tees. As we all know, practice makes perfect! RoboCup fires your ball up to 14 feet or further depending on the speed and conditions of the green. Your purchase of the RoboCup includes the Caddy Cord. Put this weighted piece of rope around the back of the hole so that it can marshall your missed putts back into the cup. Ultimately, your goal is to make all of your putts (and then retire having won 25 major championships). However, an intermediate goal should be that all of your putts are at least returned to you. If you miss too wide, you'll have to retrieve the ball yourself. If you stroke the ball way too hard, it may hop over the Caddy Cord. And if you leave it short, well, you never even had a chance of sinking it. The combination of the RoboCup and the Caddy Cord provides a fun way to drastically increase your accuracy because it forces you to "miss small". 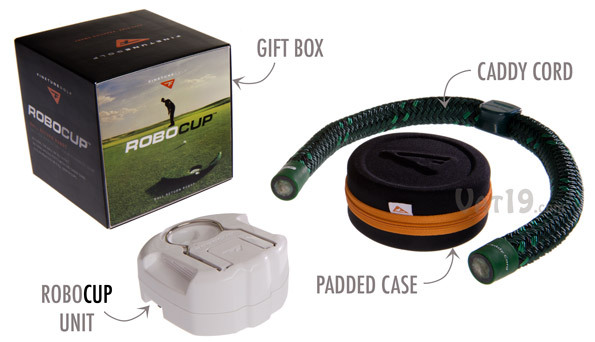 The included Caddy Cord collects a missed putt back into the cup so the RoboCup can catapult it to you. 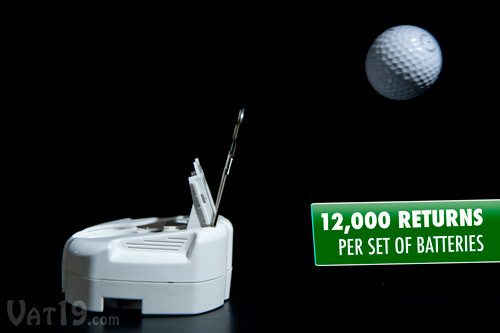 The RoboCup Ball Return Robot can return up to 12,000 putts before you need to change the batteries. Dang. Note: The RoboCup requires 4 AA batteries which are not included. A single set of 4 AA batteries (not included) will last for up to 12,000 ball returns. 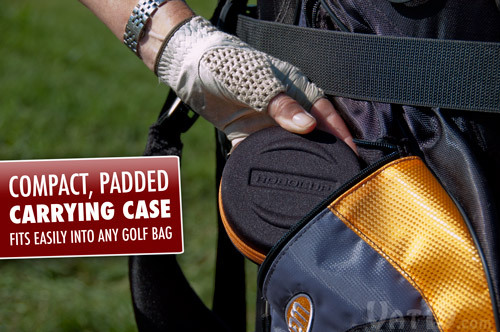 The RoboCup comes with a padded zippered case so you can always keep the unit handy in your golf bag. The RoboCup includes a zippered padded case which fits easily into any sized golf bag. We've all done it. Here's the scenario: You need a gift for Mr. Awesome and it turns out that he's a golfing fanatic. You figure since he enjoys golfing that he'll love anything even remotely related to golf. So, you get him something that has been "golf-ified". And that's how you end up purchasing the highly questionable "Born to Golf...Forced to Cook" apron. He opens the package and graciously tells you how much he loves it. Deep down you know he's lying. He likes to play golf, not wear aprons about golf. That's why the RoboCup is probably the greatest golf gift of all time because golfers can actually use it to improve their score. The RoboCup won the Best New Product award at the 2009 PGA Merchandise Show. Even pros on the PGA tour use this product. It's the real deal. 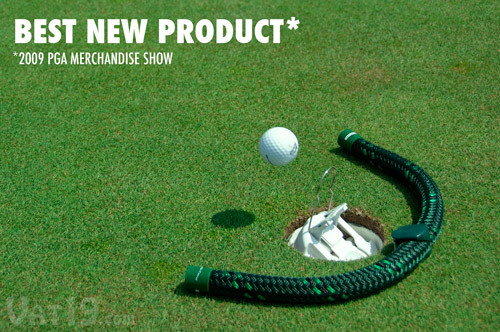 The golf fanatic in your life will love you not only for the thought, but also for this truly useful gift. So, buy, buy, buy! The RoboCup Ball Return Robot includes an attractive gift box, the RoboCup unit, Caddy Cord, and zippered padded case. Question: Will it work in any cup? Answer: Yes, you can use the RoboCup in both practice and full-depth cups. Question: Does the RoboCup need to be reset after each time it returns a putt? Answer: No. The RoboCup automatically resets itself. Question: So, the Caddy Cord only corrals putts that have been hit too hard? Answer: Yes. The Caddy Cord is placed behind and around the hole. As any golfer will tell you, if the putt is short, it never had a chance. So, missing short is bad and to reinforce this, the RoboCup makes you walk to retrieve the ball. Remember that while the RoboCup creates convenience, its primary purpose is to help improve your putting accuracy. Question: What if I miss my putt wider than the width of the Caddy Cord? Answer: Hit a better putt next time. Joking aside, the purpose of the RoboCup is not only to allow you to practice more putts in a shorter amount of time, but also to improve your accuracy. Your goal should always be to sink your putt, but at worst your putt should be close enough for the Caddy Cord to collect. Question: If the RoboCup only returns the ball up to 14 feet, how do I practice 30 footers? Answer: Only 14 feet?! Truthfully, most amateur golfers have no trouble getting a 30-foot putt within 6-8 feet of the hole. Things get dicey when trying to nail that pesky 7-footer when a few bucks are on the line. The RoboCup putting return system will markedly improve your accuracy on these common, yet difficult distances.